Aww! Fab photo! 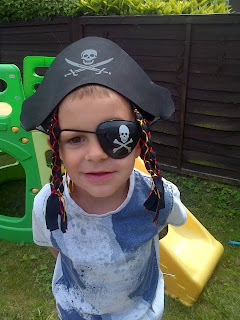 He makes a fantastic pirate!! Those pirate family holidays sound amazing!! LOL my boys are the same! Love pirates! They have already decided on their Halloween costumes (yes it is next month!!!!!!) and they want to be pirates!!! Playing Pirates was always my favourite growing up. Just noticed in "Next" today that they have a child's bed in the shape of a boat all decked out with Pirate accessories.